SunPower, a world-leading solar manufacturer based in California, published stronger than expected second quarter earnings in late July, but offset any good news by guiding massive losses for the full year. Much like the lion’s share of the solar industry around the world, SunPower has had a difficult year, with ups and downs that make it hard to get a firm read on the company’s financial position moving forward. The company reported a relatively poor 2017 and provided lackluster guidance for the first quarter and the year ahead. Soon afterwards the company announced, in the wake of the newly-announced US solar tariff, it was cutting an estimated 200 jobs and was set to incur restructuring costs between $20 million and $30 million. That same solar tariff, however, opened the door for the company to buy the embattled SolarWorld Americas, one of the two companies who led the way for the tariff to be enacted in the first place, and giving SunPower US-based manufacturing capabilities. Conversely, when it came time to publish its first-quarter earnings, SunPower was able to narrow its net loss and beat earnings expectations, but didn’t promise much in the way of strong guidance. Another quarter gone and things for SunPower remain topsy-turvy, beating guidance and analyst expectations but providing guidance of mammoth net losses through 2018. 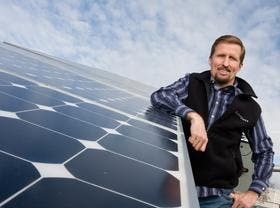 SunPower reported GAAP revenue of $449.1 million for the second quarter, a 15% increase on the first quarter and 37% increase on the same quarter a year earlier (non-GAAP revenue was $447.2 million and similarly up quarter-over-quarter and year-over-year). The company’s non-GAAP earnings per share were -$0.01, an unexpected narrowing on both the previous quarter and the same quarter a year earlier which served to beat analyst expectations by $0.28. The company also reported record bookings for the quarter with shipments increasing by 37% quarter-over-quarter, and saw its own downstream global installations increase by 45%. However, despite respectable second quarter results — and near-term confidence from investors, which has resulted in a steady increase in the company’s share price since its second-quarter results were published — the company’s outlook for the rest of the year is shaky, at best, and has been hit hard by the imposition of the US tariff on solar imports stemming from the section 201 trade case which wrapped up in January. Specifically, SunPower predicts its third-quarter GAAP revenue to be in the range of $425 million to $475 million with a gross margin between -1% to 1% and a net loss of between $215 million to $195 million. On a non-GAAP basis, the company expects revenue to be in the range of $450 million to $500 million with a gross margin of between 6% to 8% and MW deployed in the range of 400 MW to 430 MW. Further, the third quarter guidance excludes the impact of SunPower’s intention to buy SolarWorld Americas. Looking forward to the full-year 2018, SunPower now expects EBITDA to be in the range of $95 million to $125 million compares to its previously guided $75 million to $125 million, and has increased its expected net loss from being in the range of $125 million to $100 million up to a whopping $830 million to $860 million.